Earlier this year, it was revealed that the US Pacific Northwest could face a 1-in-10 chance of a suffering a catastrophic, 9.0 earthquake within the next 50 years. We have to do a better job preparing for it. That’s where Japan comes in. Japan is one of the most earthquake-prone countries in the world. We all know that the quake in March 2011 devastated the coast of the Tohoku area. But the nation’s savvy disaster preparedness likely saved thousands of lives. The US and other countries are also prone to earthquakes, but are not nearly as prepared or conscientious. And the Big One could be just right around the corner. Let’s take a look at what Japan does right, and how the rest of us can improve. Earthquakes are ingrained in Japanese life; every year, around 2,000 shake the country. This has created a society that’s aware of Mother Nature’s temperamental power, and a government that takes the omnipresent seismic threat seriously. 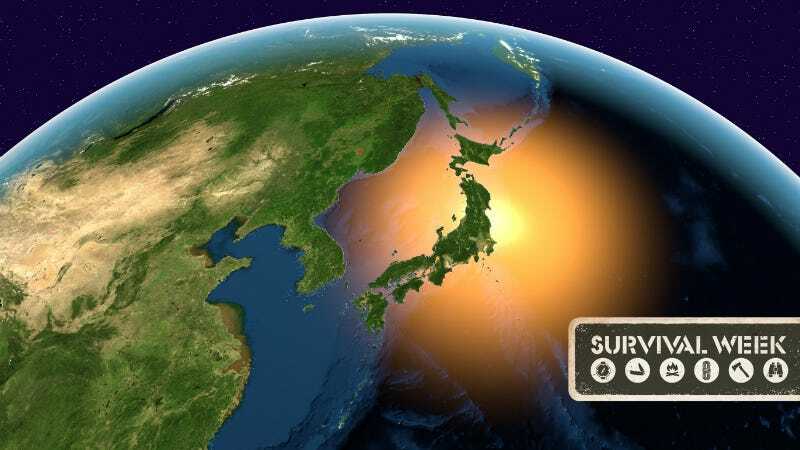 Also worrying: Tokyo University researchers predict a 70% chance of another huge earthquake hitting Japan as early as next year—and this time, it might hit the capital city. But Tokyo, despite being named the second-most exposed city in the world for natural disasters, is well prepared. For one, Japan is a world leader in the number of quake-resistant structures. In Tokyo, 87% of buildings are reportedly built to withstand earthquakes. Skyscrapers and high-rises must follow strict building codes, and often rest on Teflon that allows the base of the buildings to slide ever-so-slightly during a tremor. Others (including some here in the US) are built on rubber or inflated, fluid-filled bases that can absorb seismic shocks. Then there’s Tokyo Skytree: Opened in 2012, it’s the tallest tower on the planet. The soaring 2,080-foot structure took 100 engineers, architects and planners to create a quake-proof design. In addition to steel-reinforced concrete poles that root it over 160 feet into the ground, Skytree’s inner structures mimic the shape of ancient wooden pagodas, which are famous for standing strong in the midst of quakes and storms. For older buildings, Japanese companies are willing to invest, experiment, and innovate. A Tokyo real estate company is toying with 300-ton, $51 million vibration-dampening pendulums that allow skyscrapers to better sway in the face of intense shaking. The US needs more of that willingness to invest in and experiment with quake-prevention infrastructure. And infrastructure means more than building and retrofitting anti-quake structures. Living in a coastal area like Tokyo—or Seattle, or San Francisco, or Los Angeles—means not only threats from Pacific Rim-triggering tremors, but followup tsunami. Just this week, California and Hawaii were issued a tsunami warning for the 8.3-magnitude quake that struck off the coast of Chile. Waves even reached as far as Japan. On the outskirts of Tokyo, underneath a soccer field and skate park, lies the cavernous Water Discharge Tunnel, a four-mile-long, 5-story-high underground complex that catches flood water from tsunami or cyclones, then safely redistributes piecemeal into the nearby Edo River. CNN says it cost $3 billion and took 13 years to build—but hey, if the safety of your citizens isn’t worth investing in, what is? An inside look at the “Water Discharge Tunnel” near Tokyo. Finally, with all of Japan’s amazing public transportation, of course it has anti-quake measures in place for its railways, including the world-famous shinkansen, or bullet train. Back during the 2011 9.0 quake, there were 27 bullet trains whizzing up and down the archipelago. Thanks to huge network of earthquake sensors peppered across the nation, all the superfast trains hit the emergency brakes seconds before the main quake hit, once those initial seismic waves were detected. Zero people were killed, or even injured. That’s good for Japan’s residents and for its record number of visiting tourists, of course. But it’s also great for other countries, including the US, which has just started construction on high-speed rail in California, earthquake central. Plus, just this week, it was announced that a private American venture is partnering with a Chinese rail consortium to try to build high-speed rail that’ll link Las Vegas and the Los Angeles metro. If we’re going to pursue that type of technology in earthquake-prone regions, it damn well better be safe. In Japan, if you build a building or vehicle that’s going to house or shuttle lots of people, it must be resistant to seismic activity. We need to adapt that mentality in the US now, and can’t wait any longer. This is especially vital in densely populated, urban areas that are at high risk of a big quake: Los Angeles, San Francisco, San Diego, and Seattle, for starters. We have our work cut out for us: Pretty much all of eastern San Francisco is at “very high” liquefaction risk. Thankfully, researchers are on the case. Last year, a team at Stanford revealed a cheap way to retrofit a house that can withstand shaking three times as violent as the 1989 Loma Prieta quake that hit San Francisco and collapsed part of the Bay Bridge. But a big challenge is the relatively low public awareness of quake danger, especially compared to a place like Japan where it’s ingrained in the culture. It’s a trickle-up effect: If people are vocal about the risks, that could lead to greater government spending to invest more in quake response or quake-mitigating technologies. This year’s New Yorker piece brought the upcoming Pacific Northwest quake to new heights of public awareness, though seismologists have known about it for decades. Lucy Jones, a seismologist at the US Geological Survey, worked with the mayor of Los Angeles to submit a detailed proposal of 17 quake safety recommendations. They include fortifying aqueducts for drinking water, free wifi in the city post-quake, and buildings to not only keep human life intact but also remain usable after an earthquake. The trick is retrofitting things grandfathered in under weaker codes (which is slow, expensive, and usually voluntary), and in making sure people follow the codes in future building. An earthquake test conducted by US structural materials manufacturer Simpson Strong-Tie. Another thing the US can improve upon? We need a reliable system that immediately alerts citizens of danger — and public sirens don’t cut it. Meanwhile, Japan was a world pioneer in an early earthquake detection system. “We have 1,000 stations around the Western US,” Jones says. “We need more like 2,000 or 3,000.” The reason? Money, of course. The US Geological Survey are the ones funding the installation of stations at this at this point, but we need bigger budgets and more help from Congress. And with a subsequent tsunami, in particular, communication is key. Because basically, the best defense is: head for the hills. We need to make sure that we get alerts to our phones, just like AMBER Alerts and flash flood warnings. There are services you can sign up for to get such alerts emailed or texted to you. But we don’t have as comprehensive, accessible, and fast system as Japan, and we need one right now. What services are available with the sensors that we do have? ShakeAlert.org is an early earthquake alert service that pulls from USGS data to relay information about incoming quakes to its project partners, including major universities and government agencies. CWarn is a nonprofit that pulls data from international agencies like the US Geological Survey, the Japan Meteorological society, the NOAA, and more to provide instant SMS alerts to members who sign up for the free service. But we still need to make coverage more robust by adding more stations across the country that’ll detect an earthquake’s initial waves early. Japan’s operated a national public alert system since 2007, and the tiny island nation is literally covered with sensors. All the life-saving tech and infrastructure in the world don’t mean diddly, though, if the humans behind that technology aren’t ready: Meaning, how will we respond on an individual level? While the US excels in, say, wildfire response—at an average of 72,000 wildfires per year, we’re much better acquainted with that disaster’s presence and threats—we must improve our quake preparedness. Earthquakes aren’t a nebulous threat that only strikes distant lands like Nepal. They can, and will, hit the US. A keystone of Japanese life is the notion of vulnerability: This is a volcanically active country regularly hit with typhoons and sits on four tectonic plates, accounting for 20% of the world’s strongest quakes per year, The Guardian reports. As a result, Japanese begin training for natural disasters as soon as they start their schooling. “Problems in dealing with the risk of natural disasters are the usual ones: the probability of disasters are low but the impacts would be huge, the costs of mitigation are significant, and people making investments are too often obsessed by earning profit or reelection in the short term,” says John Vidale, a seismology professor at the University of Washington. Again, though, it’s all about the Benjamins. Seismologists say that extremely violent quakes are in store for much of the American West Coast, so it’s either pay up now and at least begin getting ready, or be cheap now and suffer later. “The other issue impeding progress is the game of trying to get someone else to pay the costs,” Vidale adds. “Whether it is monitoring, retrofitting, or making sensible plans.” In Japan, the government shoulders this cost—out of necessity, but also out of vigilance. The government reportedly spent $1 billion building its famous early alert system, which granted Japanese 80 seconds to turn off gas lines, get away from windows, and take cover during the 2011 Tohoku earthquake. All that said, humans can only prepare so much. No matter how many buildings we retrofit or sensors we install or drills we run, we’re also going to need to depend on our situational awareness. If you’re caught in an earthquake, don’t run. Don’t jump out of the bed to check on the kids. Stay put until the ground stops shaking. The best thing to do is hide under a sturdy piece of furniture and shelter yourself from stuff that can fall on you. If you plan to visit an earthquake-prone place like Japan or California, you shouldn’t live in fear that you’ll be swallowed by the earth, but it doesn’t hurt to be prepared. If you’re moving there, have an earthquake kit handy. Read up on what your destination suggests for safety measures, and if you’re traveling overseas, register with your country’s embassy. Beyond that, there needs to be a sense of urgency from lawmakers in the US. We need to fundamentally change the way we think about disasters, because if we don’t start getting ready for it now, it’ll already be too late. And that means working with nations like Japan that lead by example. “Seismology is a very collaborative science,” Jones says. We are all sharing the same planet, after all.